Call it foodie fury with a Tarantino twist. DC Comics imprint Vertigo recently released the rollicking, sword and sushi tale Get Jiro: Blood and Sushi, the prequel to The New York Times bestseller Get Jiro!, penned by novelist/screenwriter Joel Rose and chef/globe-trotting TV host Anthony Bourdain. Yes, Bourdain is not only a comic book author, but a major collector since childhood. What is even more interesting is that it is old-school horror, humor, and underground comix that rocked his world. mental_floss recently chowed down with Bourdain and Rose at New York City’s Sake Bar Hagi to discuss their inspiration and collaboration on Get Jiro: Blood and Sushi, which focuses on the titular young yakuza who, contrary to the wishes of his kingpin father and psychopathic younger brother, is quietly training to become a master sushi chef. In other words, he is learning slicing and dicing of a different sort. 1. BOURDAIN AND ROSE HAVE BEEN LONGTIME FRIENDS. Back when Rose edited the literary quarterly Between C & D on New York City’s Lower East Side in the 1980s, Bourdain “sent me some comics that he had drawn and written and we’ve been good friends ever since,” says Rose, who later co-wrote the three-volume La Pacifica graphic mystery novel for DC along with editing and contributing to various crime-related titles there. “Then we had this idea to do something together in a genre that we love.” In this case, they both love Japanese yakuza movies. 2. THEIR COMIC BOOK COLLABORATION BEGAN SPONTANEOUSLY OVER THE HOLIDAYS. 3. BOURDAIN RELATES TO HIS TORTURED YAKUZA PROTAGONIST. 4. A MOBSTER WITH CULINARY SKILLS CAN BE HANDY. When one considers that Jiro has beheaded people, it makes sense that he could contemplate and shift into the art of cooking. Either way, the cutting of meat is involved. 5. THERE ARE SOME CULINARY DISCUSSIONS IN THE BOOK. During one memorable scene in the prequel, Ichigo discusses the origins of the Japanese dish shabu-shabu before offing someone at dinner. It’s a smart way to introduce food chatter into the story by telling his intended victim what he will not be able to enjoy in the future. 6. AS A KID, BOURDAIN COLLECTED SOME TWISTED TALES. Bourdain was a child in the late ‘50s and ‘60s, after extreme violence had been excised from the comic book world following a slew of deliciously twisted comics titles in the first half of the ‘50s created an uproar and led to the creation of the Comics Code Authority. “If you saw a few drops of blood, especially red blood, in a comic it was a big thing,” he says of his childhood years. 7. WORKING ON THE GET JIRO BOOKS UNLEASHED BOURDAIN'S CREATIVE BLOODLUST. 8. THE PREQUEL WAS CONCEIVED DURING A TV INTERVIEW. 9. BOURDAIN AND ROSE LOVE AND RECOMMEND THE FOODIE MANGA OISHINBO. 10. 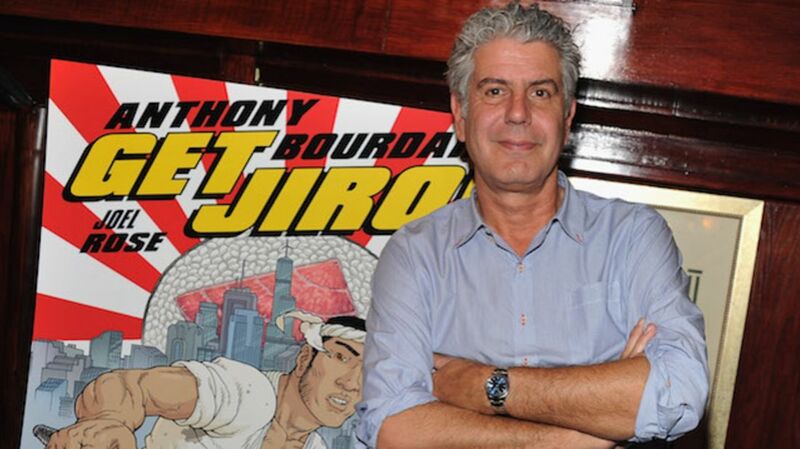 BOURDAIN APPRECIATES A WIDE RANGE OF COMIC BOOK TITLES. “I collect Terry and the Pirates in hardcover,” reveals the chef. “I have every single Spirit story that Will Eisner did in one form or another. [Nick Fury, Agent of S.H.I.E.L.D. artist] Jim Steranko, his classic work. The Neal Adam Batmans turned [the series] around and made it dark and awesome again. Classic EC, early MADs. Harvey Kurtzman. And the Bay Area undergrounds—R. Crumb, S. Clay Wilson, Spain Rodriguez—were huge, powerful influences on the way I saw the world."